Egyptian authorities have issued a warning about a perfume being distributed in the country resulting in the user’s death within three days. 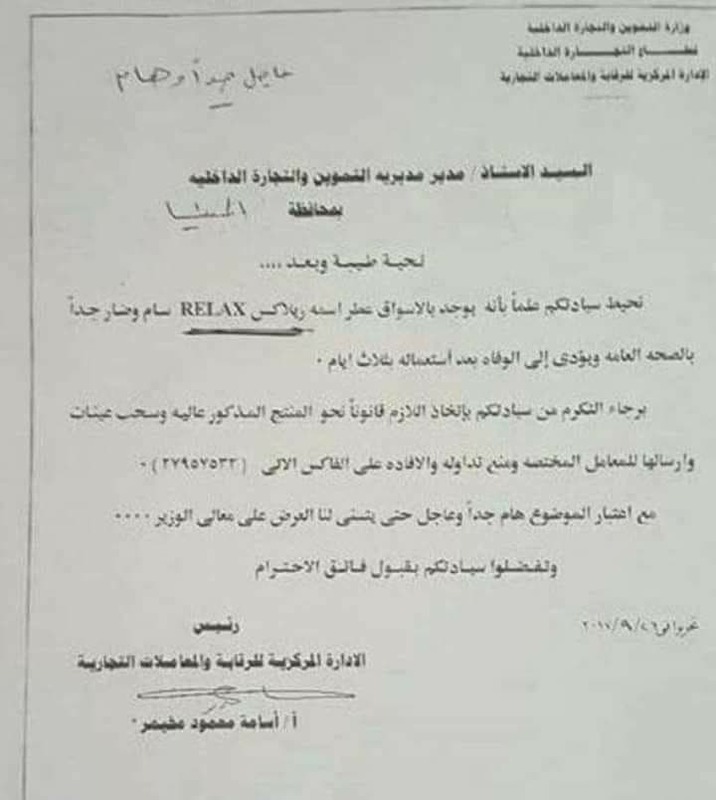 The Egyptian Ministry of Supply issued a warning over the perfume called “Relax.” The fragrance was being distributed in some pharmacies and fragrance shops. The ministry sent a letter to all supply directorates in the country’s governorates, demanding them to launch a campaign to search for and confiscate the product. The ministry also demanded that the respective directorates send samples of the liquid to specialized analytical laboratories. They must also alert citizens to steer away from purchasing it. Responding to the call, intensive campaigns have been launched targeting most gift, perfume and accessory shops, and pharmacies to find the deadly fragrance. A government source cautioned that the perfume may also be imported into the country under a foreign name. He continued saying that authorities are ordering samples of each and every foreign perfume on the market to check whether they match that of the concerned perfume. To ensure the safety of the Egyptian people quickly, social media users intensively spread a word of caution about the perfume.